Entertainment’s “The Artist” and 20th Century Fox’s “The Descendants” were the big winners at the Golden Globes last night. 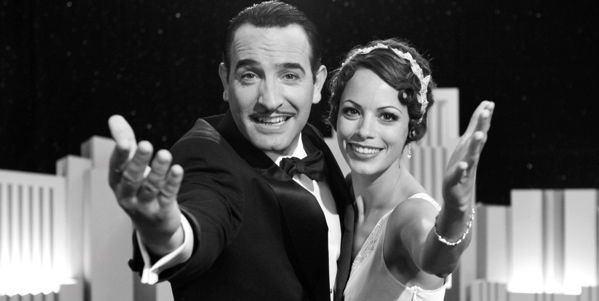 “The Artist” took three awards including best comedy or musical, while “The Descendants” won two including best drama. The awards presented on Sunday in Los Angeles saw “The Artist” star Jean Dujardin pick up the prize for best actor in a comedy and musical, and the film’s composer Ludovic Bource win for best score. George Clooney was named best actor in a drama for “The Descendants”, which 20th Century Fox will release in UK cinemas on Jan. 27. Martin Scorsese won as best director for “Hugo”, to be released on DVD and Blu-ray by Entertainment in Video, which also has “My Week With Marilyn”, for which Michelle Williams was honoured as best actress in a comedy or musical for her performance as Marilyn Monroe. Meryl Streep won as best actress in a drama for her performance as Margaret Thatcher in “The Iron Lady”, which Twentieth Century Fox Home Entertainment will release. Woody Allen picked up the screenplay award for his comedy “Midnight In Paris” while Christopher Plummer was named best supporting actor for “Beginners”. Both are on Universal Pictures UK. Paramount Home Entertainment will release Steven Spielberg’s “The Adventures Of Tintin”, which won the award for best animated feature and Disney has “The Help”, for which Octavia Spencer was named best supporting actress. StudioCanal will release “W.E.”, for which the film’s director Madonna won for best original song for “Masterpiece” co-written by Julie Frost and Jimmy Harry. On the TV side, Golden Globe Awards went to three series released for home entertainment by TCFHE: Showtime’s “Homeland” won as drama series while star Claire Danes won as best actress in a TV drama; “Modern Family” won as best TV comedy or musical series; and Jessica Lange was named best supporting actress in a TV series, mini-series or move for “American Horror Story”. Former “Friends” star Matt LeBlanc won as best actor in a TV comedy or musical for the BBC sitcom “Episodes”, shown in the US on Showtime and released on DVD here by BBC Video, which also handles the BBC crime show “Luther”, for which Idris Elba was named best actor in a TV mini-series or movie. Kate Winslet won the prize for best actress in a TV mini-series or movie for “Mildred Pierce”, released by Warner Home Video, which also has “Game Of Thrones”, for which Peter Dinklage won as best supporting actor in a TV series, mini-series or movie. ITV’s “Downton Abbey”, released on home video on the Playback label, won the award for best TV mini-series or movie. Laura Dern was named best actress in a TV comedy or musical for HBO’s “Enlightened” and former “Frasier” star Kelsey Grammar won as best actor in a TV drama series for Starz Entertainment’s “Boss”. This entry was posted in Film, News and tagged 20th Century Fox, Entertainment in Video, Golden Globes, The Artist, The Descendants. Bookmark the permalink.